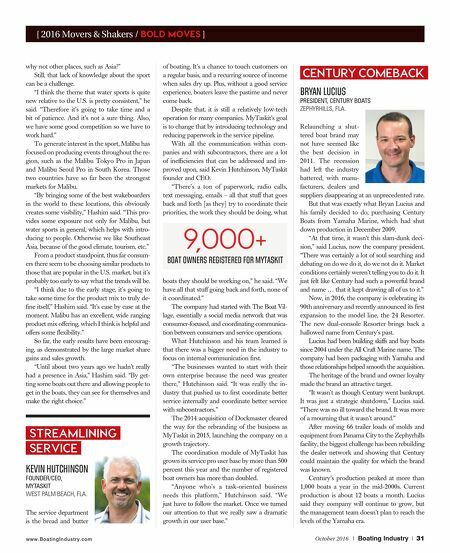 www.BoatingIndustry.com 30 | Boating Industry | October 2016 FUEL SOLUTIONS BILL BRACKNEY MANAGER, PRODUCT ENGINEERING AND DEVELOPMENT, MOELLER MARINE PRODUCTS SPARTA, TENN. When the Envi- ronmental Pro- tection Agency finalized a series of regulations for evaporative emis- sions for the ma- rine industry in 2009, it meant a big change for boat manu- facturers and the industry as a whole. And for fuel tank manufacturer Moeller Marine Products, that meant a new level of responsibility as it worked to help its builder partners prepare for the change. Several innovations from Moeller, under the leadership of Bill Brackney, have helped manufacturers meet those demands over the last several years. In 2011, the company introduced its poly diurnal tanks to meet the barrier and fuel per- meation requirements, but since then several other innovations have furthered its offerings: Redi-Tanks – Instead of a custom tank like Moeller's typical offerings, this off-the- shelf solution gives smaller builders an easy tank solution. Internal venting – By changing the potential location for vents, this option gave boat builders more design fl exibility. Aluminum tanks – As a polymer tank maker, Moeller had looked at aluminum tanks as competitors, but the team realized two things: they were already welding aluminum to make their molds and there were custom- ers that were never going to want a poly tank. This addition helps reach those customers. Diurnal components – Since the intro- duction of diurnal tanks in 2011, the compo- nents have not come down in price, so Moeller decided to develop its own components, re- sulting in cost savings for its customers. But what truly sets Moeller apart is its dedi- cation to being a resource for its customers. "We sell Moeller on the fact that we are a full-service provider," Brackney said. "We want to offer great service and great cus- tomer satisfaction." Earlier this year, Moeller launched its TIP Talk, a semi-monthly newsletter that offers technical and practical information on fuel systems. Brackney's team also now offers full-ser- vice engineering design and consulting. "We want to be able to service and pro- vide … a one-stop shop for our customers," Brackney said. "We design the tank, we de- sign the location of the components, we get the tip study out, we can turn it faster, with greater customer satisfaction." GROWING MARKETS STEVE HASHIM ASIA & MIDDLE EAST SALES MANAGER, MALIBU BOATS BANGKOK, THAILAND To grow the boat- ing industry, smart manufacturers need to fi nd new markets both in the United States and overseas. Malibu identifi ed Asia as a market for great potential growth and in 2013 Steve Hashim was tasked with developing the market. In just a few short years he has helped grow sales there by more than 300 percent, increasing Malibu's market share from 7 percent to more than 50 percent of the tow boat market. A big part of Hashim's job has been to introduce water sports to a region that is relatively unfamiliar with the activities and lifestyle compared to the American market. "Asia is important for Malibu because there is an opportunity for water sports to grow in the region," Hashim said. 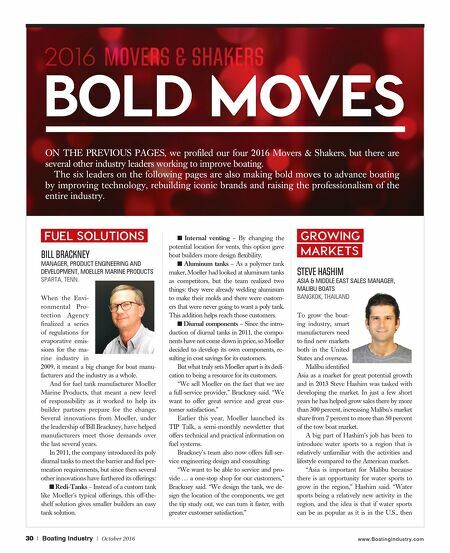 "Water sports being a relatively new activity in the region, and the idea is that if water sports can be as popular as it is in the U.S., then BOLD MOVES 2016 MOVERS & SHAKERS ON THE PREVIOUS PAGES, we profi led our four 2016 Movers & Shakers, but there are several other industry leaders working to improve boating. The six leaders on the following pages are also making bold moves to advance boating by improving technology, rebuilding iconic brands and raising the professionalism of the entire industry.